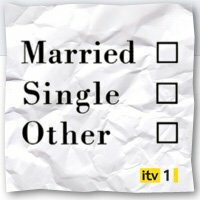 All the Bingo Hideout pals stayed in this evening to watch the latest episode of Married Single Other on ITV, and my goodness Kleenex shares must have gone through the roof if the amount of soggy tissues we have all gone through are anything to go by. You would think it was just the girlies that are sobbing into frayed bits of loo roll, but the guys are just as bad. Luckily we didn’t all watch it together or we would have been howling like a load of she-wolves with mascara smudged eyes (and that’s just the guys!). No we all watched Married Single Other in our own respective homes forgoing the opportunity to grab a swift half or a few games of bingo at the local Mecca, to catch up with the goings on at the heart breaking drama. It was so very sad, at last the ‘marriage shy’ Lillie had caved in and agreed to marry Eddie only to find out that she has just a matter of weeks left to live after being diagnosed with a brain tumour. Then the drama increases with the rushed organisation of a wedding in a matter of days, all the couple’s lovely friends pulling together to make their dream wedding plans come true. Babs being the unconventional Best Man to Lillie, Dickie coming to the rescue preparing his ‘shag wagon’ to loan the pair for their honeymoon, Eddie the Groom pulling in all the favours he can to make a venue that Lillie could die for (and quite literally so! ), Clint being – well Clint. This latest episode, the fifth couldn’t have been more gripping, the final scenes of the ambulance complete with ’Just Married’ across the back doors, suddenly skidding to an abrupt halt and then the blue light and sirens suddenly blaring into action. Then we all suddenly realised that Lillie was not actually going to get to go on her honeymoon with her prince charming after all! Sob, sob and more sob! For those that haven’t seen any of the six episodes of the brilliant Married Single Other series (are you mad? Better start watching it before next week on ITV player), you might think with all this gut wrenching sadness that it is too depressing to watch, well you really couldn’t be more wrong. Every one we have come across who watches the series, Bingo Hideout staff, partners, friends etc all rate this as the best drama / light comedy series for some time. If you think of Friends but with more soul, Eastenders with loveable characters and less screaming, Doc Martin with a little less stuffed shirt, Three Pints of Lager and a Packet of Crisps with a little more grown up humour – this is witty, pithy, emotionally draining and heart breaking in equal measure. Bingo Hideout can’t wait for next week, but we know its going to hurt. Please Mr script writer can’t you make this all a nasty dream for our lovely Lillie?